I don’t know what it is, but it seems like “resolutions” has gotten such a negative connotation in the past few years. Sure, I understand how it can be disheartening to set some lofty goals, only to feel disappointed when life gets in the way and you end up falling short. However, I’m always in the camp of bettering yourself and personal growth. While I don’t necessarily think you should wait for the start of a new year to do so, if it’s a fresh calendar year (or month or week) that gives you a healthy dose of motivation, I’m all for it! Go get ’em, gf. I will say, though… Typically, my fitness routine doesn’t really change based on the time of year. As I’ve mentioned before, I prioritize my workouts first and foremost for my mental sanity… I turn into a m’f’ing c-r-a-z-y person if I’m not blowing off some steam on the reg, ya feel me? BUT the start of this year is a little bit different since I’ve been out of the country for the last four months! I don’t have any fitness resolutions necessarily, but I’m so so excited to get back into my regular workout routine in Chicago. I went to my first SoulCycle class since I’ve been back yesterday (which was also the first spin class I’ve taken IN ENGLISH in over four months!) and man did it feel G-O-O-D. And I just re-activated my ClassPass account, too! I think I’ve mentioned it here and there, but my workout schedule was all over the place while I was on Remote Year. The first month in Lima, I went to yoga probably only three times. The second month in Medellin, I went to yoga a handful of times and made it to the gym most weekdays. The third month in Bogota, I went to my favorite spin class almost every day that I was in town. And then in the last month in Mexico City, I went to a cycling studio another handful of times. I just let it flow… When it worked with my schedule and felt good to do so, I worked out. And when it didn’t, I didn’t and I didn’t beat myself up about it. It was a nice change of pace! I’ll be the first to admit that there used to be a time when I would get kind of obsessive about working out. In hindsight, it was during a time when I felt like my life was spiraling out of control, and making it to a class every day (sometimes more than once) was my way of trying to exercise* control. (*no pun intended, haha.) That all came to an abrupt halt when I fractured my ankle! While that was definitely a pretty terrible time, it did teach me to lighten my grip and broke my obsessive nature when it came to working out. I much prefer the easy-going place I’m in now, even though I’m not as in as good of shape as I once was! Workout classes! I’d say the number one topic of questions that land in my DMs & Instagram Stories definitely has to be about my fitness routine, workout classes, and how I balance (and pay for) it all. And I’ve got one answer: CLASSPASS. I used to go to SoulCycle religiously. And while I still love to go on occasion, I don’t love to pay $30 a class to workout. Baiiiii money. 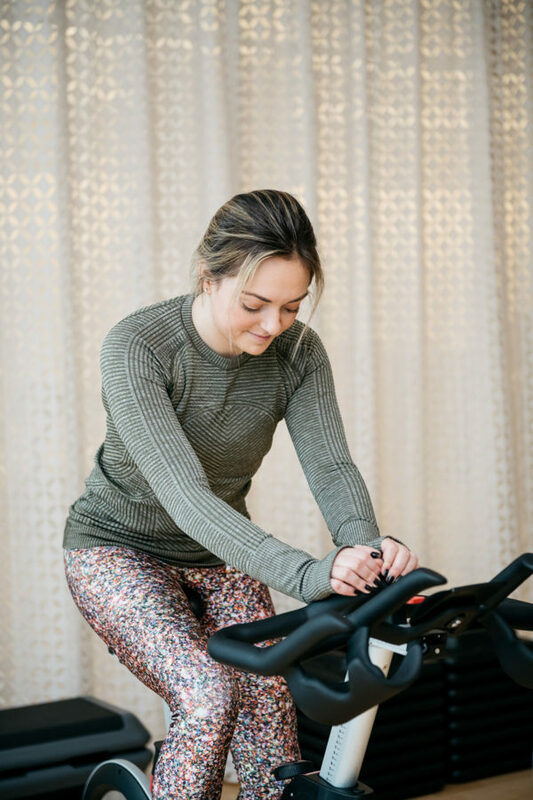  In October of 2017, I decided to join ClassPass and give it a go and I haven’t looked back since. Outside of SoulCycle and Orange Theory, every workout studio I love to go to is on ClassPass. CorePower Yoga, Studio Three (for spin & yoga), Studio Lagree, Flywheel, Barry’s Bootcamp, Yoga Squad (formerly Yoga Six), Title Boxing, Solidcore, and even Chill for meditation classes! I’ve long been eyeing Class Pass to try out… maybe now is finally the time! You’ve gotta do it! It’s so fun (for me, at least!) to be able to switch up my workouts on the reg. And why not if you’ve got a month free, you know?! Hi! How long have you had these sneakers for? I’m looking to purchase a new pair for the gym and outside running. I bought these on Black Friday last year, so sometime in November 2017! I’ve had them for over a year and absolutely LOVE THEM. They’re the only sneakers that don’t give me shin splints while running. Totally!! Couldn’t agree more. Glad to hear you love it, too! I really understand why working out is important for me. But I like it that you have now a more relaxed attitude in this context. Such a class pass sounds fantastic btw!